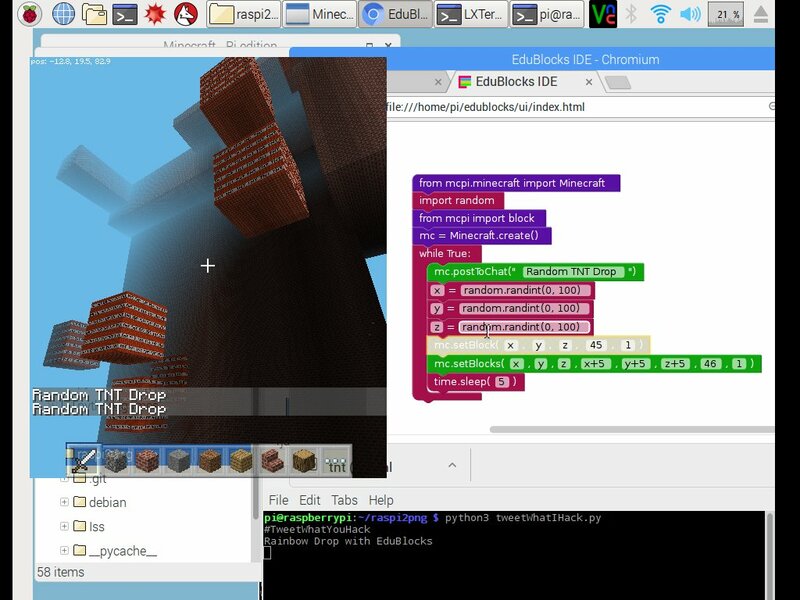 To install EduBlocks type in the following into the following terminal on Raspberry Pi. In summary the new version you can easily save, load and switch between block mode and see the python version of the code. Furthermore you can save the python version of the code. Also you can easily stop the script when you are bored with running it by pressing Esc on the keyboard in summary. Its more awesome than it was before. Great work again Josh et al. Josh has developed with the help of others EduBlocks to try and bridge the gap between visual programming and textual programming in Python. I came across this a few months ago and had an initial play and created some crude hacks using his drag and drop interface. These can be accessed here. It runs in chromium browser on the Raspberry Pi. Here is an example of a script that I created that randomly drops active TNT squares in the sky. Based on what I have seen so far from this 13 year old lads creation is promising. Initially you could run a script and then struggled to easily stop it. Through the grape vine he is working has created a solution to this. In the first version you couldn't save / load your script now you can!!! thanks to the hard work and dedication of Josh. You can request additional functionality and it gets added. In summary his work in progress IDE is rapidly evolving into a great introduction IDE to Python coding. I will certainly be using it at future Jams. I look forward to seeing it develop further over the coming months. Great work Josh et al. N.b. it works on all Pi's however from my experience Pi 2 and 3 are probably the optimum model to use. Glad you like EduBlocks. Great to see your awesome uses of its Minecraft features! Thank you for posting this sample code. It got my son & I to go through the process of setting up the Pi and trying this out. One thing to mention is that the code you posted a picture of will never work without 'import time'. Also, another thing to consider when trying this, is that the Minecraft server has to be started prior to running the script from Edublocks. I didn't see that anywhere and it threw me for a loop to start with.